Summer is right around the corner, which typically means more outdoor activities. With more outdoor activities comes more outdoor sporting events. When it comes to providing incredible lighting that is efficient, precise, and reliable, AEON LED Luminaires have got you covered! Stadiums, arenas, and sporting facilities around the world are making the switch to the high-quality LED lighting for good reason. Not only do they have our proprietary glare-free illumination, we are providing a better experience for the players, the coaches, and the fans for multiple sports. It’s hard to think about summer in America without thinking of baseball. It is, after all, America’s favorite pastime. With the ball flying around up to 100+ miles per hour, having precision lighting is crucial for safety. For a game that requires impeccable timing, and world class hand-eye coordination, proper illuminance is key critical. With so many different aspects of the game taking place at the same time, having reliable and consistent LED luminaires is a must have. The infield needs to see the outfield, the outfield needs to see the infield, and the fans want to see it all. With our proprietary no-glare luminaires, each position can focus on the game without eye strain. Summer is the perfect time for a great tennis match. The fun and competitiveness do not have to stop just because the sun set. Most tennis players agree that having consistent lighting across the entire court is paramount. In addition to consistent lighting, players, coaches, and fans all agree that reducing glare is one of the best benefits of having AEON LED Luminaires. The opponent, the lines, and, most importantly, the ball become much more visible which allows for a more competitive and fair match. While most golf is played in the morning and afternoon, the driving range can always be open during the summer if there is enough lighting. Have you ever finished up a late night at work and wanted to go get a bucket of balls at the range but noticed the poorly lit tees and fairways? We noticed that too. So, whether blowing off steam or perfecting your swing, using our AEON LED luminaires to provide a clear and crisp sight to down the fairway and in the tee box extends when you can get in some much-needed swings. At all levels, soccer is becoming increasingly popular, especially during the summer months. 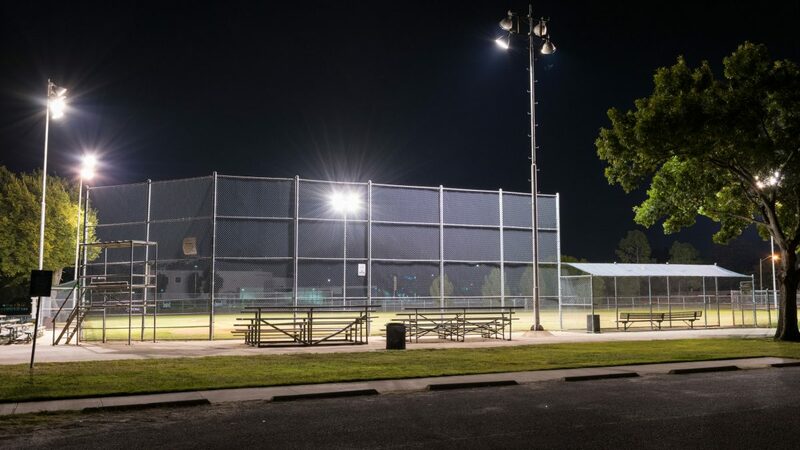 Players deserve to have a field they can see without glare, and spectators came to be able to see their favorite players, so AEON LED Luminaires are here to provide exactly what you need. Having the increasing popularity means the illuminance must stay on for extended hours. Our energy efficient luminaires allow you to enjoy reduced monthly utility bills as well as decreased maintenance expenses. So not only can we help your bottom line, we’re helping you provide a better experience for the soccer players and the fans in the stands. While football may be better known for the fall at the pro level, summer is where it all starts. From two a day practices to expedition games, summer means it is the start of the football season. Safety is an indispensable concern with football. Having a properly illuminated field for practice and games is vital for the safety of the players. Being able to see the entire field is attainable with our efficient, and no-glare luminaires. The football players can see their team, their coaches on the sideline, and their opponents easily, which allows for a safer and more enjoyable game for everyone involved. Safety is a major concern with all sports, especially when the sun sets, and the lights come on during the summer. Ensuring that the playing field, or court, is well lit, bright, consistent, has no glare, and provides a safe environment for the players and the fans is not only important, it is your duty if you’re in charge of choosing how to light your arena. Spectators come to the facility to enjoy watching a sport they love and/or to support a loved one. One a wonderful and positive experience for those who come and can truly see what they came to see. With no glare, no shadows, and an illuminance that shows the full game, or match, spectators will convert to fanatics and will return game after game. In addition to the safety of the players and the enjoyment of the spectators, having a community minded approach is very important. Light pollution is real and can disturb members of your community. Our proprietary design provides uniform and consistent light levels through the life of the luminaire. This gives you peace of mind knowing that with AEON LED Luminaires, you are avoiding light pollution and trespass. The optical accuracy our luminaires have directs light with razor-sharp precision where the light is needed without spill or sky glow. If you’re looking for LED Luminaires that is focused on player safety, spectator enjoyment, and is focused on eliminating light pollution, contact us today for a free consultation with one of our experts!